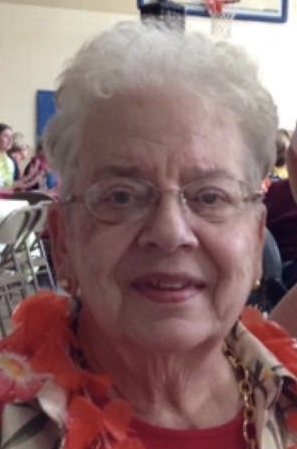 Carolyn A. Guiler, age 85 of Delavan, WI, passed away peacefully on Friday, January 18, 2019 at Mercy Walworth Hospital. She was born July 11, 1933 in Terre Haute, IN, the daughter to the late Samuel and Irene (Null) McGregor. Carolyn married Robert L. Guiler on November 27, 1952 in Terre Haute, IN. Carolyn was a member of St. Andrew’s Catholic Church. Carolyn and Robert owned and operated many businesses together throughout their life, including Anchor Inn, Clothes Horse and the Stitchery. She served as President for the city of Delavan’s Service League, Jr. Women’s Club, and was a Girl Scout Leader. Carolyn was an avid shopper to anyone who knew her. She enjoyed quilting and doll making. Carolyn and Robert traveled throughout the world during their marriage with her favorite destination being Germany. She was a loving and devoted wife, Mom, Grandma and GG to her large family. She is survived by her loving husband of 66 years, Robert, six children; Robert (Wendy) Guiler of GA, Betsy Franklin of CA, Shirley (Mike) Millsap of TN, Mike (Sandy) Guiler of Delavan, WI, Nancy (Ed) Snyder of Walworth, WI and Ann Guiler of West Allis, WI, son-in-law, Brad Dodge of Darien, WI, 20 grandchildren, 30 great-grandchildren with three more on the way, many nieces and nephews. Carolyn was preceded in death by her parents, daughter, Mary “Carrie” Dodge and two sisters, Jane and Mary Lou. Funeral Mass will be 11:00AM on Tuesday, January 22, 2019 at St. Andrew’s Catholic Church, 714 E Walworth Ave. Delavan, WI. Visitation will be 10:00AM until service time Tuesday at church. Interment will follow services at St. Andrew’s Catholic Cemetery. In lieu of flowers, memorials may be made in Carolyn’s name to a charity of your choice. Online guest book at www.haaselockwoodfhs.com. Arrangements for Guiler Family handled by Haase-Lockwood & Associates Funeral Homes and Crematory of Elkhorn, WI.